ISO 9001:2015 registered company. We strive to continuously improve on our quality management system. New England Small Tube is committed to achieving customer satisfaction and efficiency by meeting the customers' requirements the FIRST TIME-EVERY TIME! In support of this objective, we maintain and continuously improve our ISO 9001 quality management system. 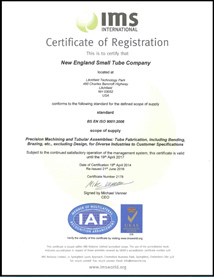 The goal at New England Small Tube is to be the best small diameter tube bending and fabrication company in the world. We strive for this goal by making customer service and satisfaction our top priorities, by setting the highest quality standards in the industry and then surpassing them, and by encouraging open communication with our customers, vendors, and employees. Call us today at (603)429-1600 to discuss your application and how New England Small Tube can help you!